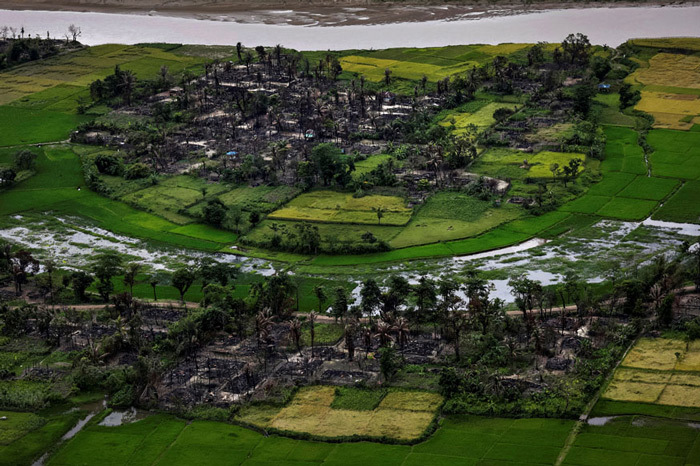 The remains of a burned Rohingya village is seen in this aerial photograph near Maungdaw, north of Rakhine State, Myanmar. 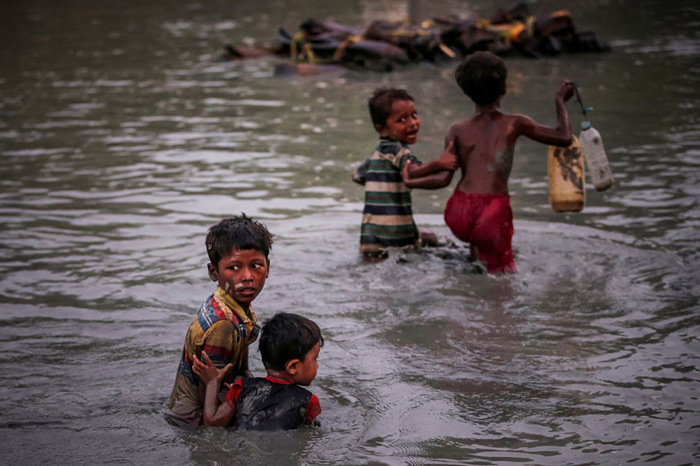 Rohingya refugees are reflected in rain water along an embankment next to paddy fields after fleeing from Myanmar into Palang Khali, near Cox's Bazar, Bangladesh. 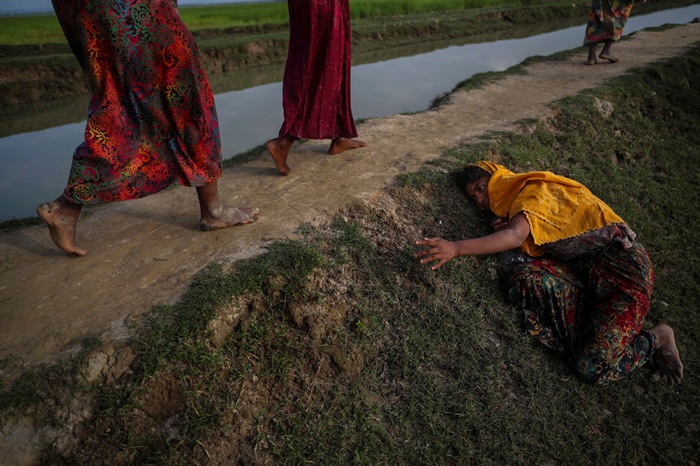 An exhausted Rohingya refugee fleeing violence in Myanmar cries for help from others crossing into Palang Khali, near Cox's Bazar, Bangladesh. 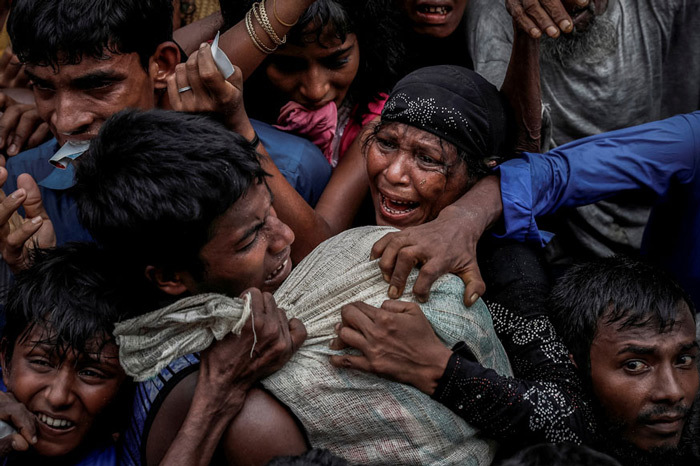 Rohingya refugees scramble for aid at a camp in Cox's Bazar, Bangladesh. 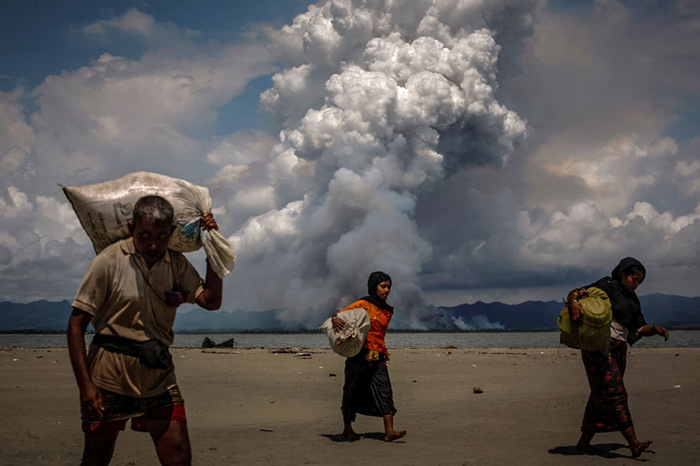 Smoke is seen on the Myanmar border as Rohingya refugees walk on the shore after crossing the Bangladesh-Myanmar border by boat through the Bay of Bengal, in Shah Porir Dwip, Bangladesh. 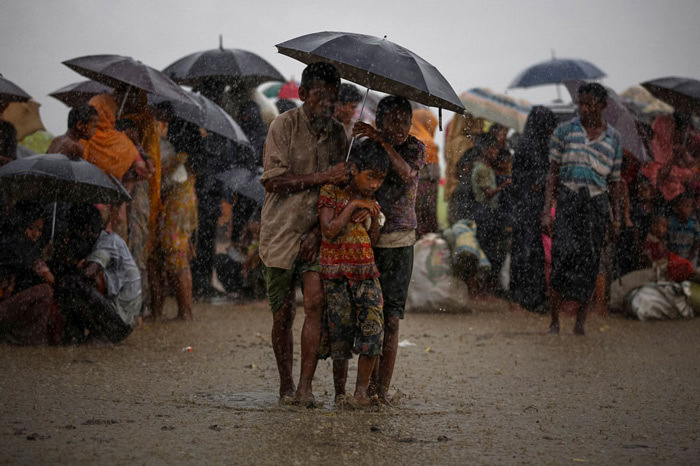 Rohingya refugees try to take shelter from torrential rain as they are held by the Border Guard Bangladesh (BGB) after illegally crossing the border, in Teknaf, Bangladesh. 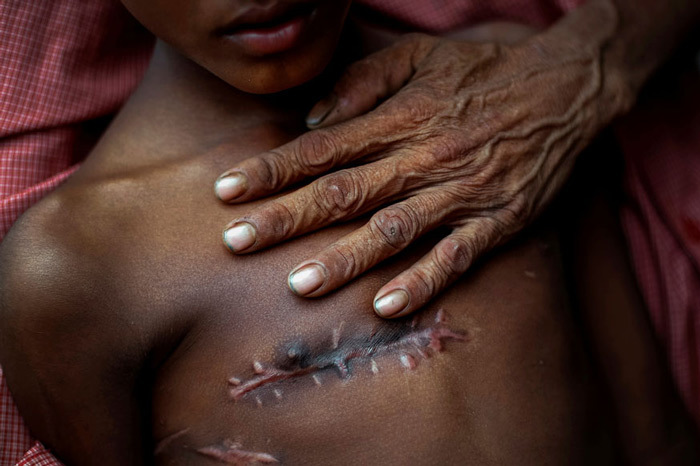 Mohammed Shoaib, 7, who was shot in his chest before crossing the border from Myanmar in August, is held by his father outside a medical centre near Cox's Bazar, Bangladesh. 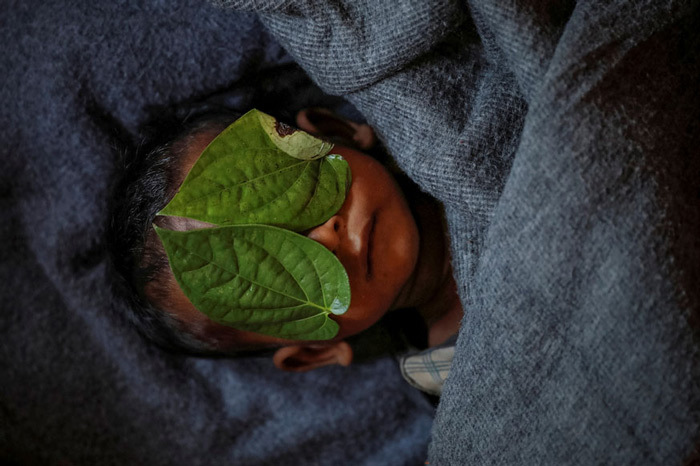 Betel leaves cover the face of 11-month-old Rohingya refugee Abdul Aziz whose wrapped body lay in his family shelter after he died battling high fever and severe cough at the Balukhali refugee camp near Cox's Bazar, Bangladesh. 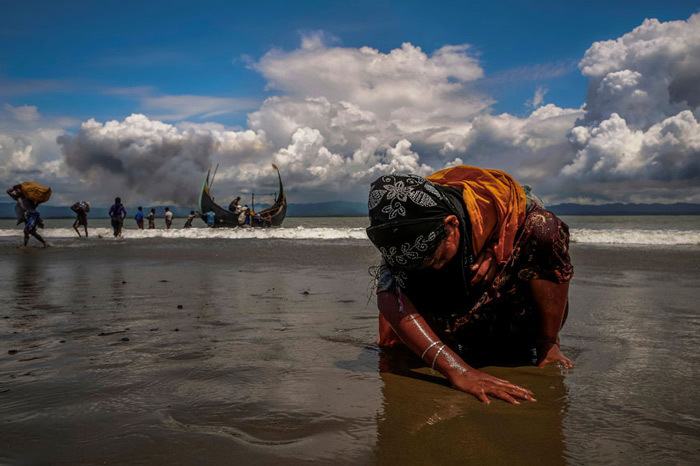 An exhausted Rohingya refugee woman touches the shore after crossing the Bangladesh-Myanmar border by boat through the Bay of Bengal, in Shah Porir Dwip, Bangladesh. 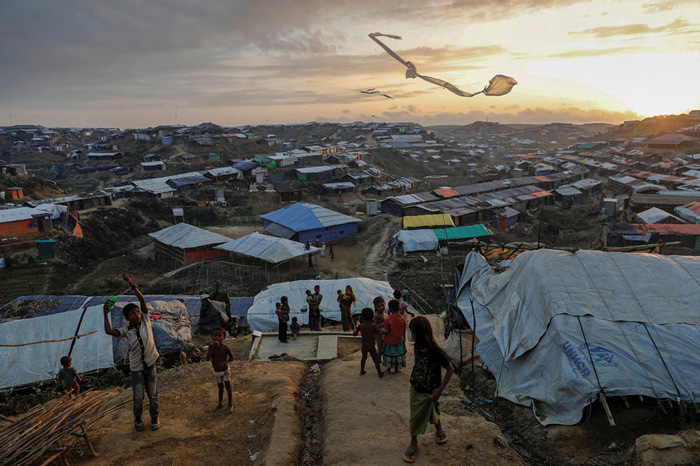 Rohingya refugee children fly improvised kites at the Kutupalong refugee camp near Cox's Bazar, Bangladesh. 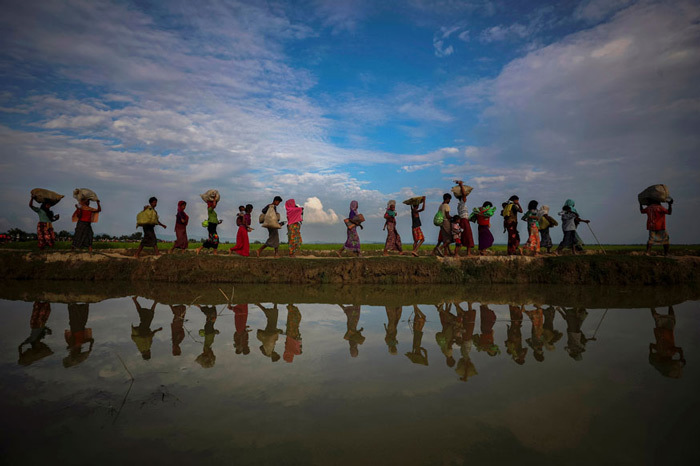 Rohingya siblings fleeing violence hold one another as they cross the Naf River along the Bangladesh-Myanmar border in Palong Khali, near Cox’s Bazar, Bangladesh.